It is commonly said that “a measure cannot be valid if it is not reliable.” It turns out that this is not true as these terms are typically defined in psychology. And it also turns out that, although reliability is extremely important in some types of research (e.g., correlational studies of individual differences), it’s the wrong way for most experimentalists to think about the quality of their measures. I’ve been thinking about this issue for the last 2 years, as my lab has been working on a new method for quantifying data quality in ERP experiments (stay tuned for a preprint). It turns out that ordinary measures of reliability are quite unsatisfactory for assessing whether ERP data are noisy. This is also true for reaction time (RT) data. A couple days ago, Michaela DeBolt (@MDeBoltC) alerted me to a new paper by Hedge et al. (2018) showing that typical measures of reliability can be low even when power is high in experimental studies. 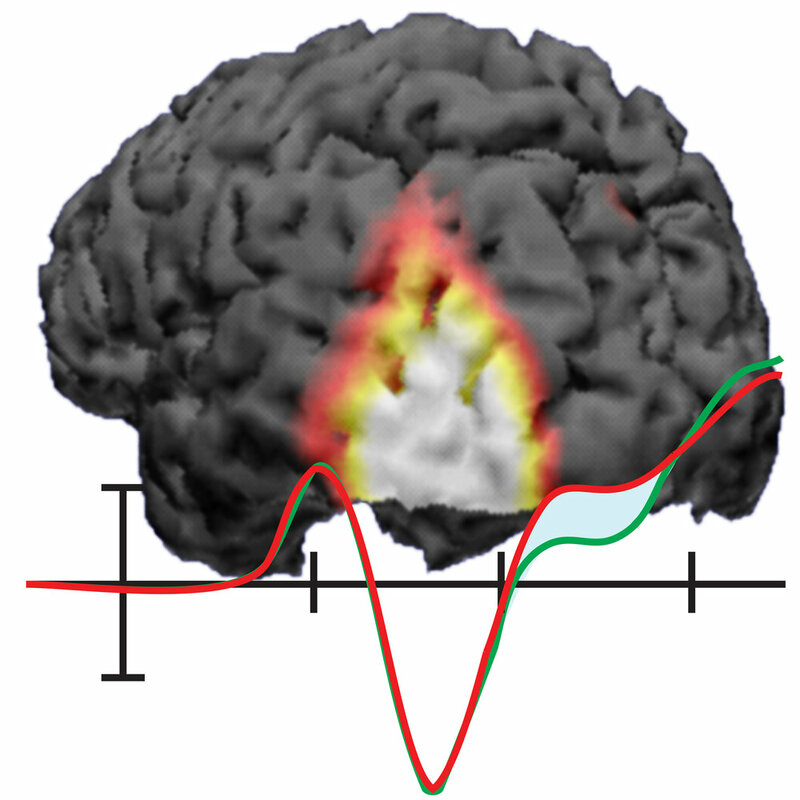 There’s also a recent paper on MRI data quality by Brandmaier et al. (2018) that includes a great discussion of how the term “reliability” is used to mean different things in different fields. Here’s a quick summary of the main issue: Psychologists usually quantify reliability using correlation-based measures such as Cronbach’s alpha. Because the magnitude of a correlation depends on the amount of true variability among participants, these measures of reliability can go up or down a lot depending on how homogeneous the population is. All else being equal, a correlation will be lower if the participants are more homogeneous. Thus, reliability (as typically quantified by psychologists) depends on the range of values in the population being tested as well as the nature of the measure. That’s like a physicist saying that the reliability of a thermometer depends on whether it is being used in Chicago (where summers are hot and winters are cold) or in San Diego (where the temperature hovers around 72°F all year long). One might argue that this is not really what psychometricians mean when they’re talking about reliability (see Li, 2003, who effectively redefines the term “reliability” to capture what I will be calling “precision”). However, the way I will use the term “reliability” captures the way this term has been operationalized in 100% of the papers I have read that have quantified reliability (and in the classic texts on psychometrics cited by Li, 2003). Let’s look at this in the context of a simple reaction time experiment. Imagine that two researchers, Dr. Careful and Dr. Sloppy, use exactly the same task to measure mean RT (averaged over 50 trials) from each person in a sample of 100 participants (drawn from the same population). However, Dr. Careful is meticulous about reducing sources of extraneous variability, and every participant is tested by an experienced research assistant at the same time of day (after a good night’s sleep) and at the same time since their last meal. In contrast, Dr. Sloppy doesn’t worry about these sources of variance, and the participants are tested by different research assistants at different times of day, with no effort to control sleepiness or hunger. The measures should be more reliable for Dr. Careful than for Dr. Sloppy, right? Wrong! Reliability (as typically measured by psychologists) will actuallybe higher for Dr. Sloppy than for Dr. Careful (assuming that Dr. Sloppy hasn’t also increased the trial-to-trial variability of RT). To understand why this is true, let’s take a look at how reliability would typically be quantified in a study like this. One common way to quantify the reliability of the RT measure is the split-half reliability. (There are better measures of reliability, but they all lead to the same problem, and split-half reliability is easy to explain.) 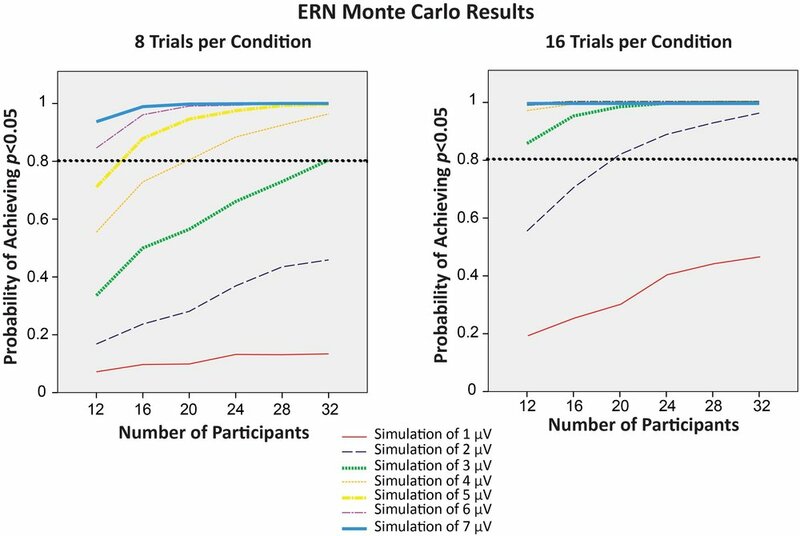 To compute the split-half reliability, the researchers divide the trials for each participant into odd-numbered and even-numbered trials, and they calculate the mean RT separately for the odd- and even-numbered trials. This gives them two values for each participant, and they simply compute the correlation between these two values. The logic is that, if the measure is reliable, then the mean RT for the odd-numbered trials should be pretty similar to the mean RT for the even-numbered trials in a given participant, so individuals with a fast mean RT for the odd-numbered trials should also have a fast mean RT for the even-numbered trials, leading to a high correlation. If the measure is unreliable, however, the mean RTs for the odd- and even-numbered trials will often be quite different for a given participant, leading to a low correlation. However, correlations are also impacted by the range of scores, and the correlation between the mean RT for the odd- versus even-numbered trials will end up being greater for Dr. Sloppy than for Dr. Careful because the range of mean RTs is greater for Dr. Sloppy (e.g., because some of Dr. Sloppy’s participants are sleepy and others are not). This is illustrated in the scatterplots below, which show simulations of the two experiments. The experiments are identical in terms of the precision of the mean RT measure (i.e., the trial-to-trial variability in RT for a given participant). The only thing that differs between the two simulations is the range of true mean RTs (i.e., the mean RT that a given participant would have if there were no trial-by-trial variation in RT). Because all of Dr. Careful’s participants have mean RTs that cluster closely around 500 ms, the correlation between the mean RTs for the odd- and even-numbered trials is not very high (r=.587). By contrast, because some of Dr. Sloppy’s participants are fast and others are slow, the correlation is quite good (r=.969). Thus, simply by allowing the testing conditions to vary more across participants, Dr. Sloppy can report a higher level of reliability than Dr. Careful. Keep in mind that Dr. Careful and Dr. Sloppy are measuring mean RT in exactly the same way. The actual measure is identical in their studies, and yet the measured reliability differs dramatically across the studies because of the differences in the range of scores. Worse yet, the sloppy researcher ends up being able to report higher reliability than the careful researcher. Let’s consider an even more extreme example, in which the population is so homogeneous that every participant would have the same mean RT if we averaged together enough trials, and any differences across participants in observed mean RT are entirely a result of random variation in single-trial RTs. In this situation, the split-half reliability would have an expected value of zero. Does this mean that mean RT is no longer a valid measure of processing speed? Of course not—our measure of processing speed is exactly the same in this extreme case as in the studies of Dr. Careful and Dr. Sloppy. Thus, a measure can be valid even if it is completely unreliable (as typically quantified by psychologists). Here’s another instructive example. Imagine that Dr. Careful does two studies, one with a population of college students at an elite university (who are relatively homogeneous in age, education, SES, etc.) and one with a nationally representative population of U.S. adults (who vary considerably in age, education, SES, etc.). The range of mean RT values will be much greater in the nationally representative population than in the college student population. Consequently, even if Dr. Careful runs the study in exactly the same way in both populations, the reliability will likely be much greater in the nationally representative population than in the college student population. Thus, reliability (as typically measured by psychologists) depends on the range of scores in the population being measured and not just on the properties of the measure itself. This is like saying that a thermometer is more reliable in Chicago than in San Diego simply because the range of temperatures is greater in Chicago. Now let’s imagine that Dr. Careful and Dr. Sloppy don’t just measure mean RT in a single condition, but they instead test the effects of a within-subjects experimental manipulation. Let’s make this concrete by imagining that they conduct a flankers experiment, in which participants report whether a central arrow points left or right while ignoring flanking stimuli that are either compatible or incompatible with the central stimulus (see figure to the right). In a typical study, mean RT would be slowed on the incompatible trials relative to the compatible trials (a compatibility effect). If we look at the mean RTs in a given condition of this experiment, we will see that the mean RT varies from participant to participant much more in Dr. Sloppy’s version of the experiment than in Dr. Careful’s version (because there is more variation in factors like sleepiness in Dr. Sloppy’s version). Thus, as in our original example, the split-half reliability of the mean RT for a given condition will again be higher for Dr. Sloppy than for Dr. Careful. But what about the split-half reliability of the flanker compatibility effect? We can quantify the compatibility effect as the difference in mean RT between the compatible and incompatible trials for a given participant, averaged across left-response and right-response trials. (Yes, there are better ways to analyze these data, but they all lead to the same conclusions about reliability.) We can compute the split-half reliability of the compatibility effect by computing it twice for every subject—once for the odd-numbered trials and once for the even-numbered trials—and calculating the correlation between these values. By contrast, statistical power for determining whether a compatibility effect is present will be greater for Dr. Careful than for Dr. Sloppy. In other words, if we use a one-sample t test to compare the mean compatibility effect against zero, the greater variability of this effect in Dr. Sloppy’s experiment will reduce the power to determine whether a compatibility effect is present. So, even though reliability is greater for Dr. Sloppy than for Dr. Careful, statistical power for detecting an experimental effect is greater for Dr. Careful than for Dr. Sloppy. If you care about statistical power for experimental effects, reliability is probably not the best way for you to quantify data quality. What if Dr. Careful and Dr. Sloppy wanted to look at individual differences? For example, imagine that they were testing the hypothesis that the flanker compatibility effect is related to working memory capacity. Let’s assume that they measure both variables in a single session. Assuming that both working memory capacity and the compatibility effect vary as a function of factors like time of day, Dr. Sloppy will find greater reliability for both working memory capacity and the compatibility effect (because the range of values is greater for both variables in Dr. Sloppy’s study than in Dr. Careful’s study). Moreover, the correlation between working memory capacity and the compatibility effect will be higher in Dr. Sloppy’s study than in Dr. Careful’s study (again because of differences in the range of scores). It’s also important to note that Dr. Sloppy would run into trouble if we looked at test-retest reliability instead of split-half reliability. That is, imagine that Dr. Sloppy and Dr. Careful run studies in which each participant is tested on two different days. Dr. Careful makes sure that all of the testing conditions (e.g., time of day) are the same for every participant, but Dr. Sloppy isn’t careful to keep the testing conditions constant between the two session for each participant. The test-retest reliability (the correlation between the measure on Day 1 and Day 2) would be low for Dr. Sloppy. Interestingly, Dr. Sloppy would have high split-half reliability (because of the broad range of scores) but poor test-retest reliability. Dr. Sloppy would also have trouble if the compatibility effect and working memory capacity were measured on different days. The figure below (from the Brandmaier article) shows what is meant by low and high precision in this context, and you can see how the SD would be a good measure of precision. The key is that precision reflects the variability of the measure around its mean, not whether the mean is the true mean (which would be the accuracy or bias of the measure). Things are more complicated in most psychology experiments, where there are (at least) two distinct sources of variability in a given experiment: true differences among participants (called the true score variance) and measurement imprecision. However, in a typical experiment, it is not obvious how to separately quantify the true score variance from the measurement imprecision. For example, if you measure a dependent variable once from N participants, and you look at the variance of those values, the result will be the sum of the true score variance and the variance due to measurement error. These two sources of variance are mixed together, and you don’t know how much of the variance is a result of measurement imprecision. Imagine, however, that you’ve measured the dependent variable twice from each subject. Now you could ask how close the two measures are to each other. For example, if we take our original simple RT experiment, we could get the mean RT from the odd-number trials and the mean RT from the even-numbered trials in each participant. If these two scores were very close to each other in each participant, then we would say we have a precise measure of mean RT. For example, if we collected 2000 trials from each participant, resulting in 1000 odd-numbered trials and 1000 even-numbered trials, we’d probably find that the two mean RTs for a given subject were almost always within 10 ms of each other. However, if collected only 20 trials from each participant, we would see big differences between the mean RTs from the odd- and even-numbered trials. This makes sense: All else being equal, mean RT should be a more precise measure if it’s based on more trials. In a general sense, we’d like to say that mean RT is a more reliable measure when it’s based on more trials. However, as the first part of this blog post demonstrated, typical psychometric approaches to quantifying reliability are also impacted by the range of values in the population and not just the precision of the measure itself: Dr. Sloppy and Dr. Careful were measuring mean RT with equal precision, but split-half reliability was greater for Dr. Careful than for Dr. Sloppy because there was a greater range of mean RT values in Dr. Sloppy’s study. This is because split-half reliability does not look directly at how similar the mean RTs are for the odd- and even-numbered trials; instead, it involves computing the correlation between these values, which in turn depends on the range of values across participants. How, then, can we formally quantify precision in a way that does not depend on the range of values across participants? If we simply took the difference in mean RT between the odd- and even-numbered trials, this score would be positive for some participants and negative for others. As a result, we can’t just average this difference across participants. We could take the absolute value of the difference for each participant and then average across participants, but absolute values are problematic in other ways. Instead, we could just take the standard deviation (SD) of the two scores for each person. For example, if Participant #1 had a mean RT of 515 ms for the odd-numbered trials and a mean RT of 525 ms for the even-numbered trials, the SD for this participant would be 7.07 ms. SD values are always positive, so we could average the single-participant SD values across participants, and this would give us an aggregate measure of the precision of our RT measure. The average of the single-participant SDs would be a pretty good measure of precision, but it would underestimate the actual precision of our mean RT measure. Ultimately, we’re interested in the precision of the mean RT for all of the trials, not the mean RT separately for the odd- and even-numbered trials. By cutting the number of trials in half to get separate mean RTs for the odd- and even-numbered trials, we get an artificially low estimate of precision. Fortunately, there is a very familiar statistic that allows you to quantify the precision of the mean RT using all of the trials instead of dividing them into two halves. Specifically, you can simply take all of the single-trial RTs for a given participant in a given condition and compute the standard error of the mean (SEM). This SEM tells you what you would expect to find if you computed the mean RT for that subject in each of an infinite number of sessions and then took the SD of the mean RT values. Let’s unpack that. Imagine that you brought a single participant to the lab 1000 times, and each time you ran 50 trials and took the mean RT of those 50 trials. (We’re imagining that the subject’s performance doesn’t change over repeated sessions; that’s not realistic, of course, but this is a thought experiment so it’s OK.) Now you have 1000 mean RTs (each based on the average of 50 trials). You could take the SD of those 1000 mean RTs, and that would be an accurate way of quantifying the precision of the mean RT measure. It would be just like a chemist who weighs a given object 1000 times on a balance and then uses the SD of these 1000 measurements to quantify the precision of the balance. Thus, you can use the SEM of the single-trial RTs in a given session as a measure of the precision of the mean RT measure for that session. This gives you a measure of the precision for each individual participant, and you can then just average these values across participants. Unlike traditional measures of reliability, this measure of precision is completely independent of the range of values across the population. If Dr. Careful and Dr. Sloppy used this measure of precision, they would get exactly the same value (because they’re using exactly the same procedure to measure mean RT in a given participant). Moreover, this measure of precision is directly related to the statistical power for detecting differences between conditions (although there is a trick for aggregating the SEM values across participants, as will be detailed in our paper on ERP data quality). So, if you want to assess the quality of your data in an experimental study, you should compute the SEM of the single-trial values for each subject, not some traditional measure of “reliability.” Reliability is very important for correlational studies, but it’s not the right measure of data quality in experimental studies. Here’s the bottom line: the idea that “a measure cannot be valid if it is not reliable” is not true for experimentalists (given how reliability is typically operationalized by psychologists), and they should focus on precision rather than reliability. A common question in ERP research is whether it is legitimate to compare conditions in which different numbers of trials were averaged together (e.g., error trials versus correct trials in an ERN study; oddballs versus standards in an oddball or MMN study). It turns out that the answer depends on how you're measuring the ERP components. In a nutshell: if you're measuring mean amplitude, then it's not a problem to compare conditions with different numbers of trials; if you are measuring peak amplitude, then it is a problem. An extended discussion of this issue can be found in this document. Here, we provide a brief summary. The figure below shows a clean ERP waveform and the same ERP waveform with noise added. Note that the peak amplitude is higher in the noisy waveform. This exemplifies a general principle: All else being equal, the peak voltage will be greater in a noisier waveform than in a cleaner waveform. 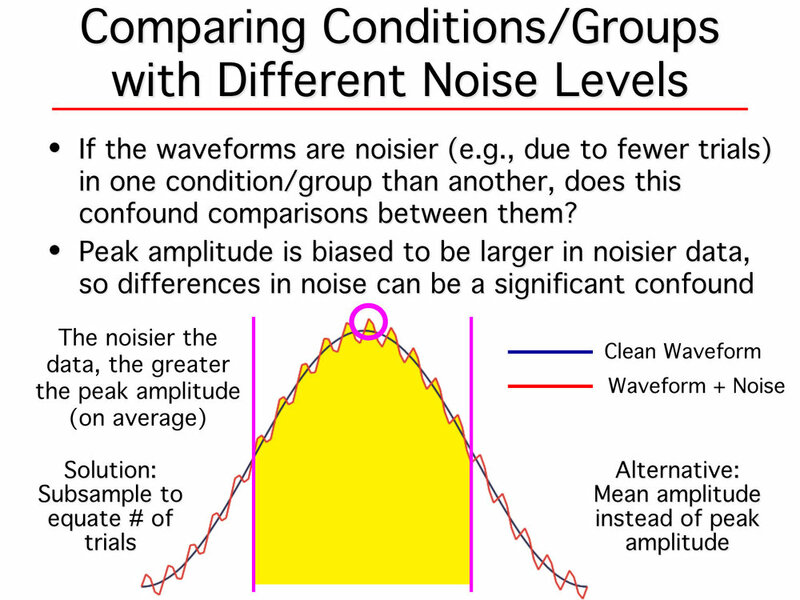 This is why it is not legitimate to compare waveforms with different numbers of trials (and therefore different noise levels) when using peak amplitude. The usual solution to this problem is to create an averaged ERP waveform using a subsample of trials from the condition with more trials, equating the number of trials in the averages. However, it is almost always better to stop using peak amplitude and instead use mean amplitude to quantify the amplitude of the component (see Chapter 9 in An Introduction to the Event-Related Potential Technique for a list of reasons why mean amplitude is almost always superior to peak amplitude). Mean amplitude (e.g., the average voltage between 300 and 500 ms) is not biased by the noise level. That is, the mean amplitude will be more variable if the data are noisier, but it is not consistently pushed toward a larger value. So, you might have more subject-to-subject variability in a condition with fewer trials, but most statistical techniques are robust to modest differences in variance, and this variability will not induce an artificial difference in means between your groups. There is no need to subsample from the condition with more trials when you are using mean amplitude. You are just throwing away statistical power if you do this. Bottom line: In almost every case, the best way to deal with the "problem" of different numbers of trials per condition is to do nothing at all, except make sure you're using mean amplitude to quantify the amplitude. Here's a really simple tip regarding the duration of visual stimuli in ERP experiments: In most cases, the duration of a visual stimulus should be either (a) between 100 and 200 ms or (b) longer than the time period that you will be showing in your ERP waveforms. Here's the rationale: If your stimulus is shorter than ~100 ms, it is effectively the same as a 100 ms stimulus with lower contrast (look into Bloch's Law if you're interested in the reason for this). For example, if you present a stimulus for 1 ms, the visual system will see this as being essentially identical to a very dim 100-ms stimulus. As a result, there is usually no point is presenting a visual stimulus for less than 100 ms (unless you are using masking). Once a stimulus duration exceeds ~100 ms, it produces an offset response as well as an onset response. For example, the image shown here illustrates what happens with a 500-ms stimulus duration: There is a positive bump at 600 ms that is the P1 elicited by the offset of the stimulus. This isn't necessarily a problem, but it makes your waveforms look weird. You don't want to waste words explaining this in a paper. So, if you need a long duration, make it long enough that the offset response is after the end of the time period you'll be showing in your waveforms. The offset response gets gradually larger as the duration exceeds 100 ms. With a 200-ms duration, the offset response is negligible. So, if you want to give your participants a little extra time for perceiving the stimulus (but you don't want a very long duration), 200 ms is fine. We usually use 200 ms in our schizophrenia studies. Also, if the stimulus is <=200 ms, there is not much opportunity for eye movements (unless the stimulus is lateralized). If you present a complex stimulus for >200 ms, you will likely get eye movements. This may or may not be a significant problem, depending on the nature of your study. How Many Trials Should You Include in Your ERP Experiment? Boudewyn, M. A., Luck, S. J., Farrens, J. L., & Kappenman, E. S. (in press). How many trials does it take to get a significant ERP effect? It depends. Psychophysiology. One question we often get asked at ERP Boot Camps is how many trials should be included in an experiment to obtain a stable and reliable version of a given ERP component. It turns out there is no single answer to this question that can be applied across all ERP studies. In a recent paper published in Psychophysiology in collaboration with Megan Boudewyn, a project scientist at UC Davis, we demonstrated how the number of trials, the number of participants, and the magnitude of the effect interact to influence statistical power (i.e., the probability of obtaining p<.05). One key finding was that doubling the number of trials recommended by previous studies led to more than a doubling of statistical power under many conditions. Interestingly, increasing the number of trials had a bigger effect on statistical power for within-participants comparisons than for between-group analyses. The results of this study show that a number of factors need to be considered in determining the number of trials needed in a given ERP experiment, and that there is no magic number of trials that can yield high statistical power across studies. We have started a new blog called Virtual ERP Boot Camp on erpinfo.org to provide tips, advice, and other information about best practices for ERP research. We will also be highlighting new research that is relevant to the field. You can also follow us on our new Twitter account: @erpbootcamp.